Dale Ekdahl is an evangelist. A map in his office literally pinpoints all the communities throughout North America he has spread his message and all the places that have taken it to heart: that grain bin safety equipment and safety training truly save lives. Dale and his wife Cindy are the owners of Outstate Data, LLC. They manufacture and sell a patent-pending rescue grain tube of the company's own design. These adjustable tubes can slide around a victim and make sure he/she is not further buried in the grain. The tube buys valuable time for rescue squads and makes it easier to extract the victim. Dale knows of two lives saved by the tubes. One farmer was able to walk away from his accident and shake the hands of his rescuers. Dale lights up when he talks about these rescues. Most grain bin accidents are fatal. The tubes are just a part of what the Ekdahls offer. Every sale comes with an on-site safety lesson, but more important, they offer intensive safety training right at their facility just outside the tiny hamlet of Erdahl in Grant County. 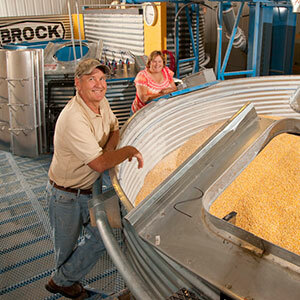 Dale shows off the two grain bins, 15 feet high, that hold 8,000 bushels of corn. The corn is courtesy of the local elevator, which actively supports and believes in Outstate Data's efforts. "When we do our training we want it to be as realistic as possible,” Dale said of the silos. When Dale retired after 34 years in the Army Reserves, he became a safety consultant for grain elevators. "I checked to see if they were up to OSHA requirements,” he said. OSHA requires special safety equipment on hand. Dale found out from the local fire departments that the grain bin rescue equipment was expensive, crudely made and didn't work particularly well. "It got me thinking that there must be a better way to build a mouse trap,” Dale said. He developed the first prototype and had the nearby Elbow Lake Fire Department test it out along with their usual method using plywood panels. The newly created tube won, hands down. Still, the firefighters shared ideas of how the tube could be improved, like forming the steps to better fit their boots, and adding inside steps as well. That's how Outstate Data was formed. Dale brought on Lee Christopherson to help build the tubes, using manufacturing equipment that is custom-made by them for the job. Cindy serves as the company's accountant. "We hit the road in 2011 [to sell the rescue tubes] and everyone wanted to buy it,” Cindy said. They sold 31 units. A unit consists of a set of five panels plus a slide hammer that pounds the panels into the grain as the tube is being formed around the victim. Most customers purchase two units. It took six months to build the units they sold on that road trip, making about six panels a day. Since then, they have honed their manufacturing equipment to whittle down the production time. "Now we make six an hour,” Lee said. They have also developed an accessory pack that goes with the tubes, which includes helmets, ropes and harnesses. To date, Outstate State Data has sold more than 200 units. The fact that they also provide extensive training often helped seal the deal. "It sets us apart,”Dale said. All along, Dale knew that good safety training was key to the ultimate goal of the rescue tubes—saving lives. Back when he was a safety consultant to elevators, he quickly learned the need for such training. "In code you are supposed to be trained in grain bin safety. I would look for this training but it was hard to find.” He decided to develop and offer his own grain bin safety course. A WCI loan helped with the funding to build the training facility that includes the grain bins, a classroom, an office, a kitchen and room for additional future training. Cindy had heard about WCI when she was employed at West Central Minnesota Community Action, Inc. in Elbow Lake. WCMCA and WCI have worked closely over the years as part of the WCI-convened Family Economic Success Council. It was a phone call with a USDA representative who asked if they had checked with WCI that reminded them of WCI's start-up loans for small businesses. They gave Vice President of Business Development Dale Umlauf a call. What Dale and Cindy liked about the WCI loan process was how simple and straightforward it was. "We definitely recommend working with WCI. You guys made it so easy. Once I found out we were eligible, I thought it would take three, four weeks, not days to complete. That was awesome,” Dale said. The Ekdahls broke ground for the training center in 2010. Craig Berg was brought on as the training coordinator. They try to keep the training costs affordable, but it is still sometimes difficult for customers to take the time for a day-long training that may require extensive travel and a hotel stay. Dale knows exactly how to make training more accessible. "Our dream is to have one facility in each state we sell in,” he said. That may be quite a few. The Ekdahls are determined to have a presence in every grain-producing state in the U.S. And they are eyeing Canada too. That map in their office already shows the migration of Dale's evangelism throughout the Red River Valley and North Dakota, down the Minnesota-South Dakota border into Iowa, and points beyond. His message is spreading. Are you interested in learning more about our loan programs? Visit loans.wcif.org, or call Dale Umlauf at 800-735-2239.